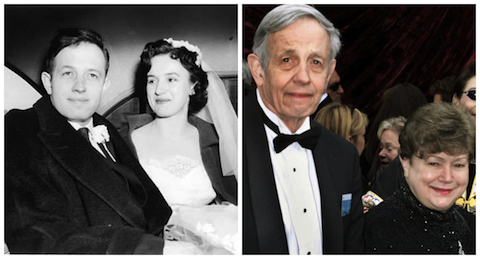 We were very saddened to learn of the passing of both John and Alicia Nash on 23 May 2015. John, 86 and Alicia, 82, were killed in a car accident on the New Jersey Turnpike as they returned home from a trip to Norway where John had received awards. There is no question that this revered mathematician and inspiring couple will be missed. Our world was made far better by having them in it. Read this article in The Atlantic that explores "John Nash's Beautiful Life." John Nash, a renowned mathematician whose life was dramatized in the Oscar-winning film, A Beautiful Mind recently received the Abel Prize for his revered work in mathematics, and in 1994 was awarded the Nobel Laureate Prize for his work in economics. He has the distinction of being the first to receive both awards. Nash, who suffered schizophrenia, often credits his successes to his amazing wife, Alicia, who stood by him, believed in him, and loved him through it all. Though he inspired many with his work, the couple's steadfast love and devotion inspired many more. And Nash's courage in the face of such a challenging condition, helped many others to believe in their own healing abilities. John and Alicia Nash are considered heroes in the mental health field due to their efforts to help break down stereotypes and humanize people with mental illness. The couple's son, John Charles Nash, (also a mathematician) is also living with schizophrenia. In a Princeton.edu news story, Nash is described by former students as the professor who would spend time with students after class, challenging one another with mathematical puzzles. With a playful attitude, Nash treated mathematics as a sport in a way that inspired his students and colleagues. Many years later, he still continued to be inspiring and approachable.